Parsnips are a minor crop in New York, but can be found at farmer's markets and retail stands. They are harvested in April and May or from October through December. Parsnips can be stored over the winter and are a good crop for winter farmers markets. 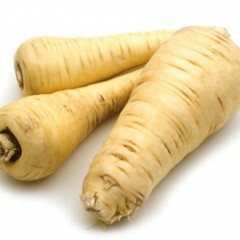 Parsnips are a member of the Apiaceae or carrot family. They are grown much the same way as are carrots and are susceptible to many of the same diseases and insects. Like carrots they require a deep, well-drained soil. They can be grown on either mineral or muck soils. A good summary of parsnip production can be found at the Ontario Ministry of Agriculture, Food and Rural Affairs website.